Do you have a particularly special photograph that tells a story about a person, place, or event? Please share! Have you seen my Biscoff Chocolate Chip Cookies recipe? It uses a similar dough and is the perfect cookie version of this recipe. In a large bowl, cream together softened butter and cookie butter spread. Add sugar and continue creaming until light & fluffy, about 2 minutes. Beat in egg, egg yolk, and vanilla extract. Add flour, baking soda, cinnamon (optional), and salt. Mix until just incorporated. Gently fold in chocolate chips. Bake in preheated oven for 15-20 minutes, depending on your oven’s temperature. You will want to remove them from the oven while they still look soft and slightly underbaked–place baking pan on top of oven and allow blondies to cool. They will continue baking in the pan for that great, perfect chewy factor. These look amazing! I will definitely be giving these a try. Stopping by from Sweet Savoury Sundays. Thanks for stopping by, Lauren–you will definitely want to give these a go! Looking forward to the next linky bash. Yes please, I will take a dozen! Yum! Duly noted! Now if only there weren’t those pesky mailing fees….thanks for stopping by, Julianne! Happy 100th! 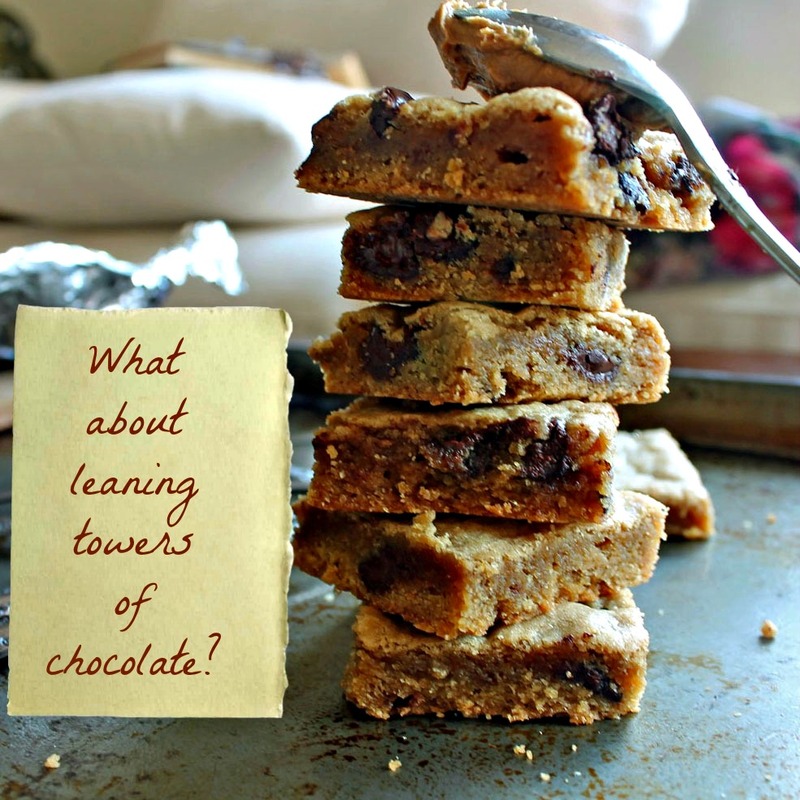 Who can resist leaning towers of chocolate? 😉 Great looking recipe – thanks. Thanks a bunch, John–and I mean it, since I know I can always count on a chipper note from you. This might call for a leaning tower of chocolate! 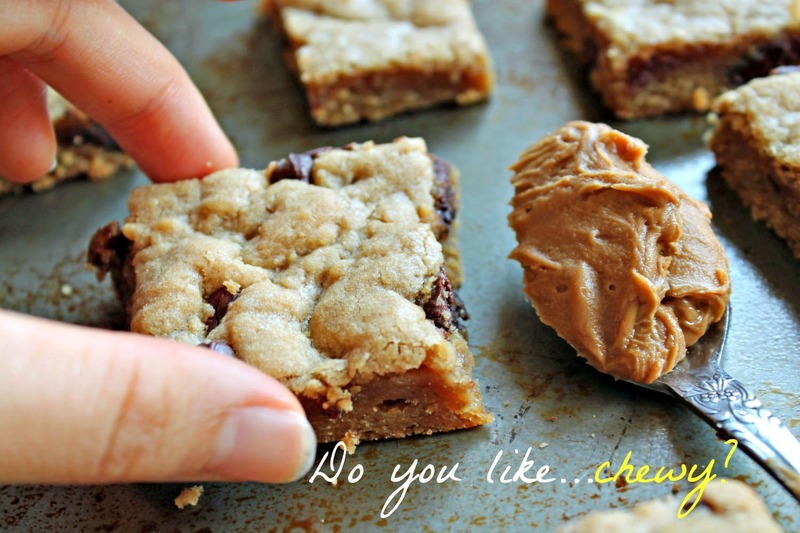 I can taste the chewy texture of these blondies… great pics. Thanks for sharing the with us on foodie friday. My pleasure–these really are the chewiest of the chewy 🙂 glad you could stop by, Diane! 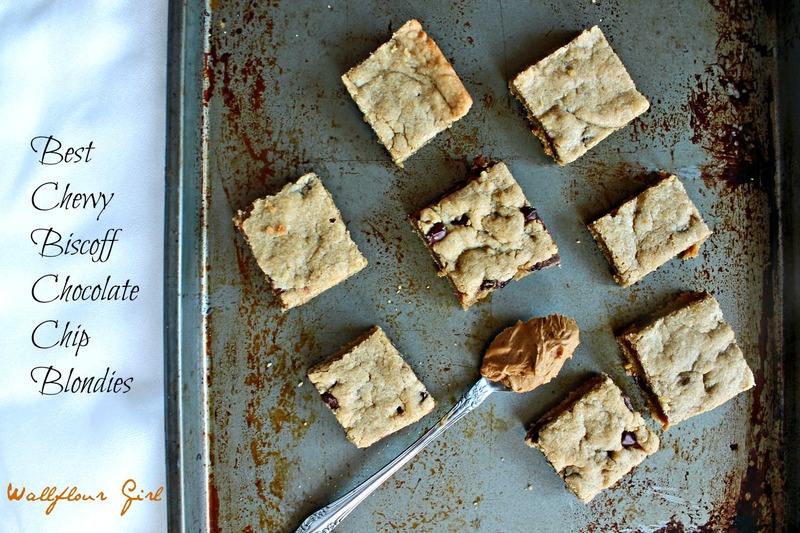 This recipe is such an enabler for my cookie butter addiction. 😉 I can’t wait to make these! My pleasure, Carrie–glad you could stop by to say hello, I was born, bred, and raised an enabler (love that word!). As long as my throne is covered in creamy and crunchy cookie butter, I think I can live with that 😉 thanks so much, and thank you for stopping by! 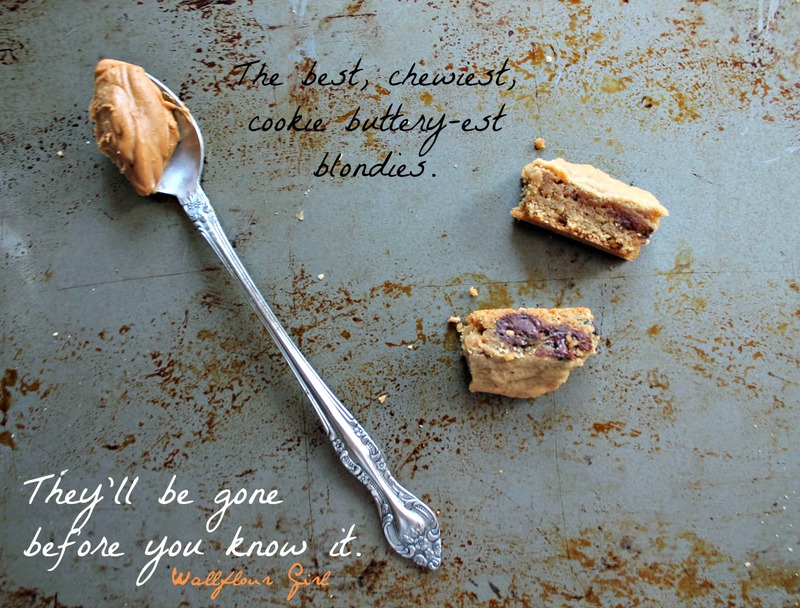 I would like to cookie butter all the things. I hear you–it’s all about spoon to face here. Spoon. To. Face. 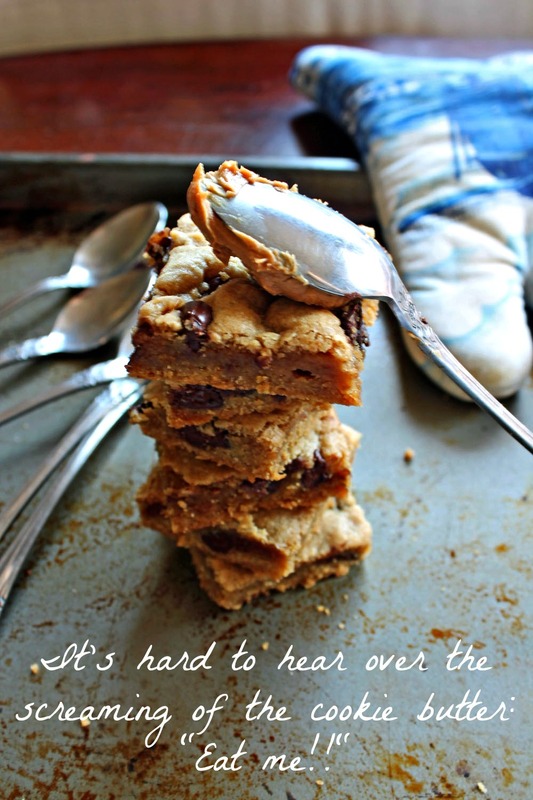 What a decadent looking cookie bar! 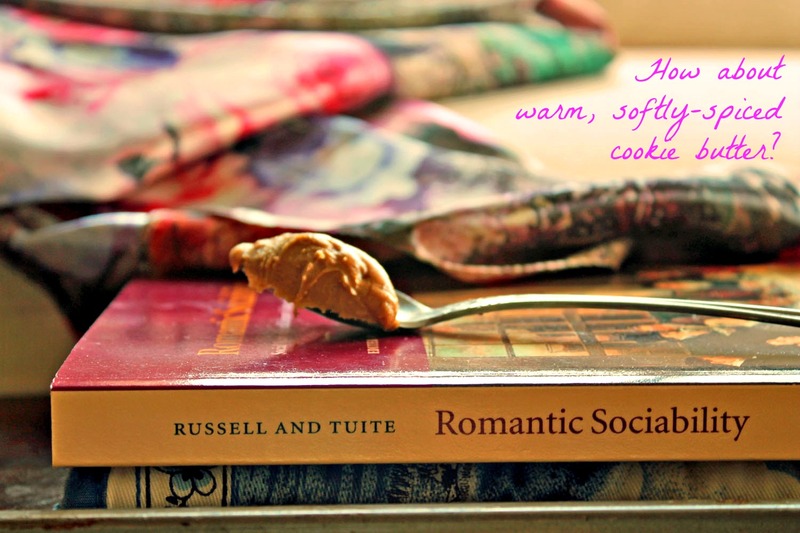 Thanks for linking up the recipe and sharing “cookie Butter” with us! Thanks, Rebecka–just doing my part to spread the cookie butter nirvana 🙂 glad I could link up, thanks for stopping by and taking the time to say hello! Oh, I hear you, Lou! My sweet tooth hasn’t stopped crying since–er, well, since that spoonful of cookie butter I smothered on these this morning. Oops? 😀 thanks for taking the time to stop by! Oh god. 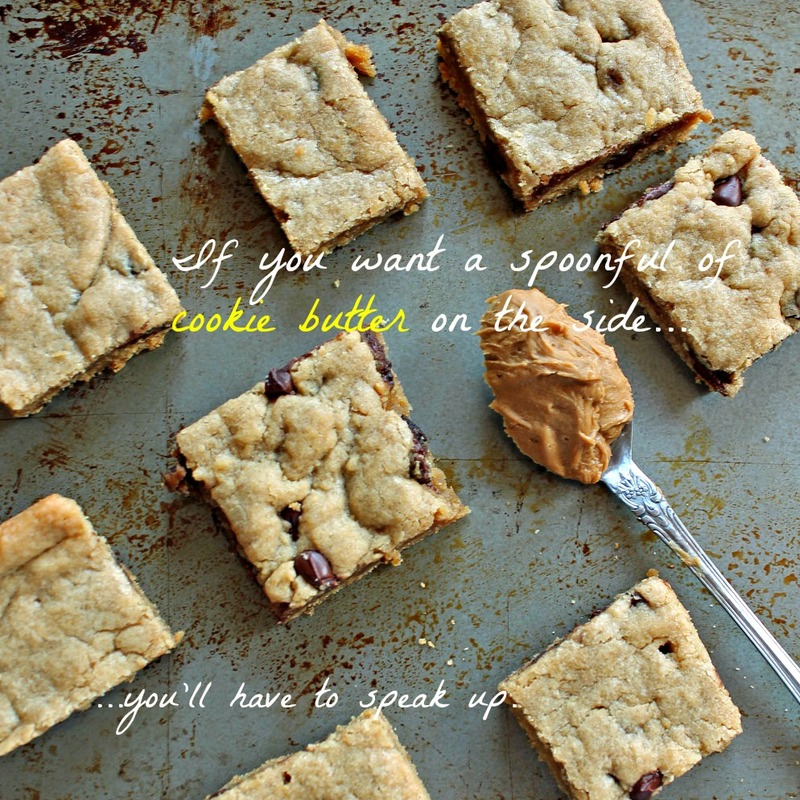 I need to go to the grocery store and get some cookie butter ASAP! These look sinful, and I’m in love. These bars look so chewy and fabulous. I’ve never baked with biscoff before but thi recipe makes me want to try. Are you on twitter? Love the bars! And such a clever photo essay! Thanks for submitting! 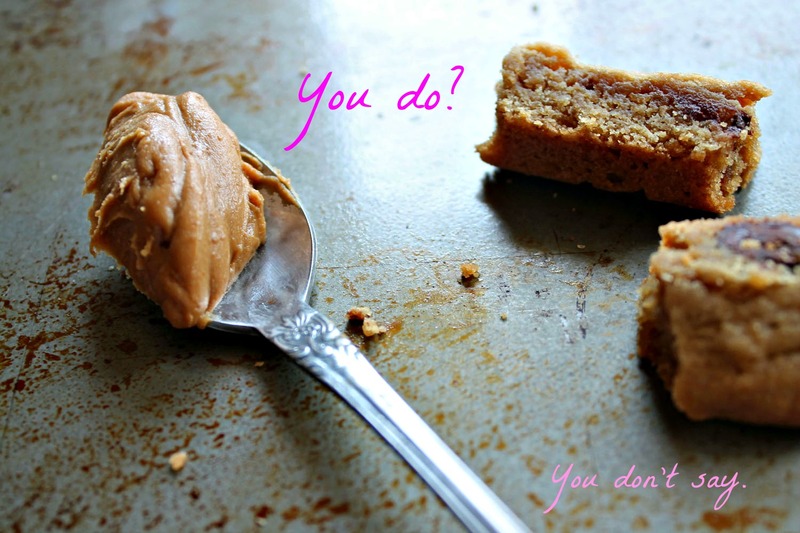 So can biscoff spread be used instead of cookie butter? Hi Kim–yes, Biscoff spread’s ingredients are essentially identical to cookie butter’s, so feel free to use either. Happy baking! I would kill for these!!! Haha! Hey! I made these yesterday and I have a question. When I made them the mixture looked more like a cookie dough, rather than a brownie batter. Is that right? I don’t use cups, so I always convert everything to grams, so it is very well possible something went wrong there. On the other hand, they were absolutely delicious and they look like your pictures, so maybe it’s just the way they’re suppose to be. Anyway, thanks for sharing this recipe!